I have been struggling with finding the perfect blog planner for the longest time. About a year ago, I decided I’d just make my own. And then, you know how it goes…things come up, I get sidetracked, I put it off…and meanwhile, all of my blog plans, editorial calendars, goals, and other important stuff is scattered around the office in six different notebooks. A few months ago, I FINALLY got it together and created a printable blog planner. And you know what? It has made my life SO. MUCH. EASIER. 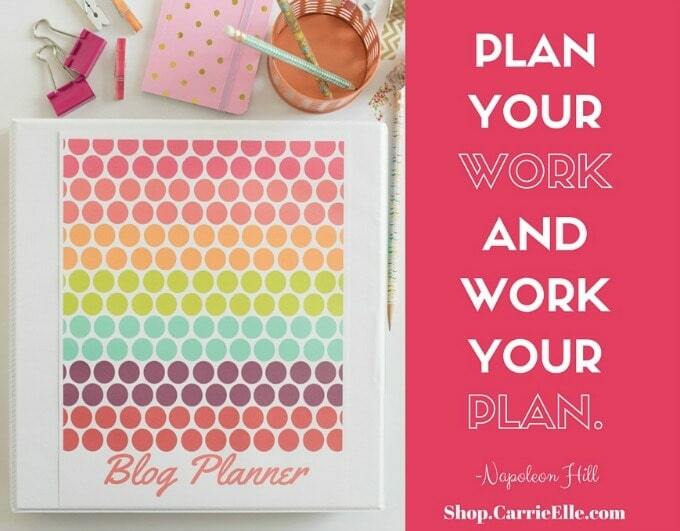 You can buy your blog planner here. Use code BLOG15 for 15% off. I LOVE this! It’s so easy to use and cute (anything cute is more likely to get used around here!). Thanks for sharing! I LOVE mine! Like all of your products…it’s super cute and easy to use! Thanks! Super pretty! & useful. Pinned & shared. Thanks for Sharing at the inspiration Spotlight party. Just love this – we all need some GREAT organization in our lives! Wanted to pop by from Foodie FriDIY to say thanks for linking up! Oh, this is so useful! I bet it saves you a lot of time 🙂 And it`s also very cute. Okay, so I’m OBSESSED with blog planner stuff now, so I’m happy to see this one! 😀 Thank you for creating it and sharing it with us!